Calling all budding Tiger Woods! Come and try golf in a fun and friendly environment. Lessons take place at Worcester Golf Range. They focus on the golf swing but also cover pitching, putting, chipping and etiquette. All lessons are a mixture of instruction and games with some healthy competition! 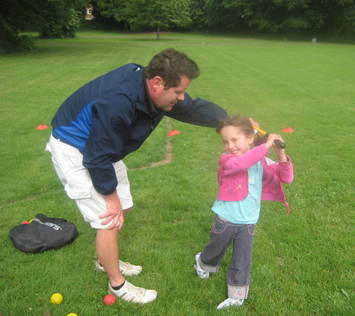 The cost is £25 per child for a 6 week course, which includes a bucket of balls and use of junior golf clubs. Please contact me if you would like to book your child in as places are limited. There is a maximum of 8 children per group and parents are welcome to stay and watch or wait within the shop area. The golf bays are undercover,so lessons take place whatever the weather. Mark Dove Golf Academy works with Golf Roots and The Golf Foundation to offer children the chance to experience and enjoy the game of golf at reasonable prices. The Golf Foundation is the main golfing charity committed to the sporting and social development of young people in golf.